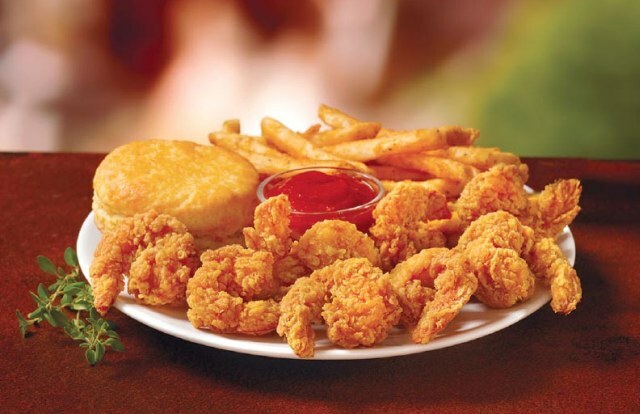 Popeyes brings back the $5 Butterfly Shrimp Tackle Box in time for this year's Lent / seafood season. Available for a limited time, the combo features eight marinated, battered, and fried butterfly shrimp, a side, and a biscuit for $5. In case you want some chicken as well, the chain continues to offer the $5 Surf & Turf, which includes two chicken tenders, four butterfly shrimp, a side, and a biscuit for $5. Popeyes also has the $20 Meal Deal, which consists of 10 pieces of fried chicken (mixed), two large sides, and five biscuits for $20 at participating locations. Finally, they introduce the new, limited-time Cookies & Cream Crunch Pie Made with Oreo. It features an Oreo cookie crumb crust filled with vanilla creme and pieces of Oreo cookies, topped with more Oreo cookie pieces and a chocolaty drizzle.